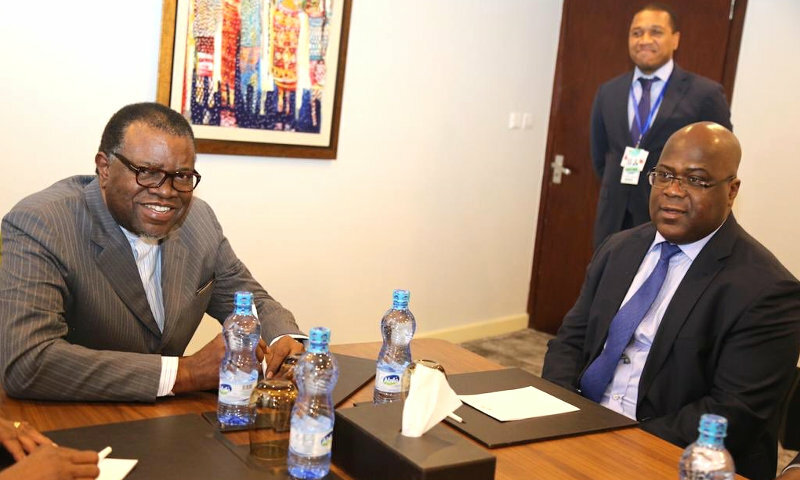 Kinshasa 11-02-2019 Politics - Questions of urgent necessity for Africa to take control of its destiny and to fight against the ominous birds have been to the rendez-vous of the meeting between Felix Tshisekedi and Hage Geingob. The President of the Republic had an interview with his counterpart from Namibia who is the current President of the Southern African Development Community (SADC). This meeting took place shortly before the meeting of SADC Heads of State following 32nd Ordinary Session of the AU. For his part, the executive secretary of the sub-regional organization, Stergona Tax, said that SADC will welcome the DRC President, Felix Tshisekedi, during his first presence at the meetings of the organization as President of the Republic.